For builds with higher horsepower and traction goals our engineering team has developed a fabricated 3x2x.120” rear frame rail set to completely replace the thin factory U-shaped rails from the leaf spring hangers to the rear bumper. Any areas of the rail that affect tire clearance, including the front control arm mounts, have been moved inboard approximately 3”, while retaining the original width around the factory gas tank. 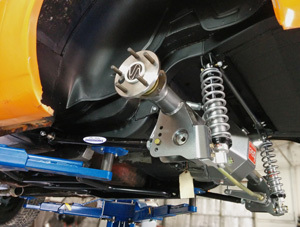 g-Link control arm-and shock-crossmember brackets are integrated into the rail to make installation that much easier. Camaro 70-81, Firebird 70-81 (GM F-Body) - g-Bar Upper Arm Bracket Weld Fixture, Ford 9"